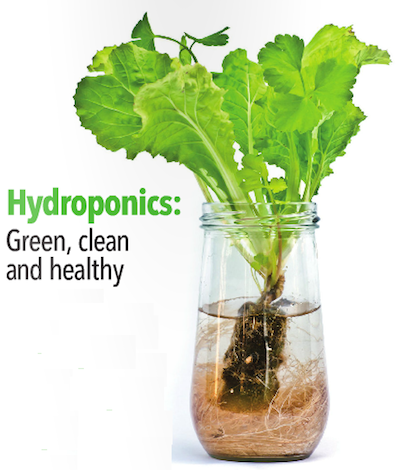 Hydroponics is a method of growing plants in a mineral-rich, water-based nutrient solution - no soil required. It's a method that produces stable, fast-growing, healthy plants that are easy to harvest and produce remarkable yields. This method of growing allows a grower to optimise plant growth on a continual basis - every minute of every day! This ensures that plants are always growing, or producing flowers, fruits or vegetables at a maximal rate. Hydroponics is a method of growing that may have its roots as early in history as the hanging gardens of Babylon. Water pumped around the gardens fed and watered the arrangement of plants. Today, feeding plants via a nutrient solution is used as a means of getting the most agricultural or horticultural produce out of a given space, in a minimum amount of time, and with limited resources. With an ever-increasing global population, one day it may be that these techniques will be one of the keys to feeding a planet which is full of humans. Already, many market gardeners and restaurateurs grow their own herbs and vegetables using hydroponics in order to ensure freshness and ultimate quality for their customers, in the quantities that they need. Newbies starting out in will find lots of brilliant information and advice for beginners at onestopgrowshop.co.uk. We Stock only premium hydroponics products that have been tested repeatedly before reaching the shelves, the staff have decades of growing experience between them, which they are eager to share with customers through demonstrations, guides or simply a chat. One Stop Grow Shop is particularly great for new growers because the staff will be able to tell you exactly what you do and what you don't need to buy, they'll also give you comprehensive advice to help you to set up your growing room or garden, and offer aftercare support and advice, meaning that you'll never feel lost. If you don't live nearby and so can't pop in, our blog offers a wealth of information for those just starting out. For example, it's good for new hydroponics growers to adopt a patient approach, and learning to be attentive to your plants will help you to secure success as it's this way you'll spot bugs or problems with root rot. Not intervening early enough could lead to the problem becoming irreversible. There's advice on buying equipment and how much you should shell out - generally, it's best to invest in the highest quality equipment you can, as otherwise you may well end up paying twice and ruining all your hard work should the equipment fail. Top quality hydroponics equipment will reliably yield top quality produce. The team at One Stop Grow Shop will explain which models and brands are worth investing your money in. There's also advice on how much space to dedicate to your hydroponics crops, as well as tips on making the most of small spaces - for example, by using grow tent shelving - and advice on how to divide the space up for the different stages of the growing process if you plan to produce continuous crops. There are well thought out complete hydroponics starter kits for sale on the website. These include the Basic Clone Propagation Kit, and 600 Watt Hydro Kits where you can grow your plants in coco, clay and soil. There are also plenty of nutrients and boosters on sale, as well as grow lights, grow tents, nutrients and pest and disease control products.